Tom Bellanca, Independent candidate fpr chair of the Board of Supervisors, has announced his list of endorsed candidates. In the past 12 months and in many cases the past 5-10 years, I’ve gotten to know many of the candidates involved in this local election personally. While there are no candidates I dislike, and most of the candidates can, I believe, do a good job, I believe it necessary to indicate which of those candidates I believe will be and act in the best interests of the residents of the county. For this reason, I am endorsing the following candidates for leadership in our county. I believe these persons to be the best options to lead our county forward in all respects and I hope you will vote for them on Tuesday, November 3, 2015. With the type of magical thinking that brought us Obamacare, Loudoun County Democrats are promoting full-day kindergarten as a central issue this year, and hoping you don’t think about how it can be paid for. …implementing FDK now, with a still massively growing school system, would be a poor use of county funds. FDK seems to be the mantra that the Dems are hanging their hat on. Yet, to my knowledge, not a single one has explained how to pay for it or what other funding items should be cut to pay for it. In the battle of wagers, Scott York comes out looking prescient regarding the Republican electorate. No one knows what’s going to happen in the Loudoun County elections on Tuesday, as is always the case, because there is almost never any polling conducted. In the race for chair of the Board of Supervisors, predictions are particularly hard because four people are running, two of whom are Independents and likely to cut into whatever party loyalty might exist in 2015. Both Republican Charlie King and Independent Scott York took the leap of faith every would-be candidate must make prior to tossing their hats in the ring, but they’ve each taken a further risk in their respective approaches during the campaign. York’s wager was an obvious one, in retrospect, but still a gamble at the time: With overwhelming name recognition throughout Loudoun County, and a reputation for being on the preservationist side of the question of development in the West, he decided to make a strong play for Republican votes by immediately endorsing a number of Republican candidates. York had most recently won office after joining the Republican ticket in 2011, riding the wave of a Republican sweep of county offices. As an Independent in 2015, he sought a different wave: of dissatisfaction among the Republican rank-and-file, and willingness to reject party authority. In case you hadn’t seen the news lately, this turns out to be a most excellent year in terms of Republican willingness to reject party authority. If there were ever a year for banking on voters to defy the local Republican Party and their “pledge,” 2015 is that year. Kudos must go to Scott York for reading the tea leaves correctly, and discerning from the temperament of the electorate following the Loudoun County Republican Committee (LCRC) convention that there might have been dissension in the ranks afterwards. 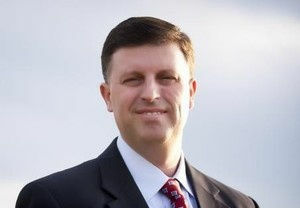 One of York’s endorsements was of Republican Sheriff Mike Chapman, who prevailed in a primary contest at the convention. Steve Simpson (L) and Charlie King had what appeared to be a joint PR effort to reduce the authority of Mike Chapman’s Sheriff’s Office. Which brings us to Charlie King’s wager. 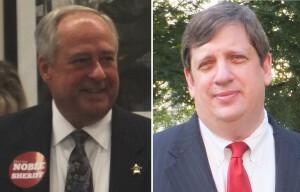 King faced a tough situation already, before York even joined the race, because a vocal part of King’s support came from a faction of the LCRC which worked to defeat Sheriff Chapman before the convention, and afterward lauded in social media and elsewhere the fact that Steve Simpson was jumping from the Republican fold to run as an Independent against Chapman. The, uh, “pledge” be damned. If anyone had a stake in the generic concept of Republican loyalty and keeping the pledge, it was Charlie King. But right off the bat, an influential part of the LCRC said, in effect, “we don’t need no stinking pledge, voting for Independent candidates is ok,” their celebratory fist bumps became roundhouses to King’s face, and into that Perot-sized opening stepped Scott York. How would King respond? Well, interestingly. In a campaign that has been absent prominent discussion of major issues, and in which the King campaign has garnered very few headlines in the local news for taking a stance on policy matters, King apparently decided last month to take a virtual jab at Sheriff Chapman by calling for creation of a county police department. That actually may be the only issue-oriented headline King has gotten this year. Scott York weighed in to correct King’s assertion that the idea had not been sufficiently explored, and to educate King about the fact that the bigger decision would be changing Loudoun County’s form of government (an odd oversight on King’s part). Steve Simpson, for his part, quickly joined in with what appeared a lot like a tag-team effort against Chapman. In terms of public perception, the notion that Charlie King was part of the “Steve Simpson wing of the LCRC” was not repudiated, to say the least: King seems to be wagering he can pull maximum votes from the anti-Chapman Republicans, tick off the other half of the local Republican electorate, and still pull out a win in the general election. King is a smart man and he does seem to understand politics, but one can be forgiven for questioning his math. Sterling Supervisor Eugene Delgaudio and Commonwealth’s Attorney Jim Plowman both campaigned actively against Mike Chapman back in April, before the convention, but since then have said nary a word about the race for sheriff and certainly nothing publicly to disparage Chapman. Both men might have believed they had some political capital to burn in opposing a popular Republican sheriff. We can’t know how Republican or Independent voters have been influenced by these political maneuvers, if at all. We can’t even say if it will matter in the end: The big winner from the battle between King and York for Republican votes could be the Democratic candidate, Phyllis Randall. If she holds onto the majority of Democratic votes, and makes some inroads with Independents, and York and King split their voters somewhat evenly, Randall could emerge with a plurality. Two factors point to King ending up on the losing side of his wager (which, for the record, I don’t want to see happen – Charlie King would make a great chair of the Loudoun Board). First, York absolutely crushed the competition in fundraising. 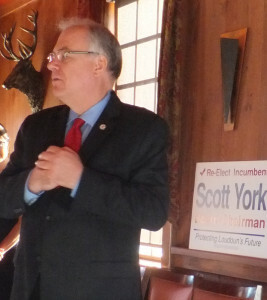 York lapped the field by raising more than his three opponents’ combined totals so far. But more importantly, York seems to have taken a huge share of potential Republican dollars. Charlie King raised less than $50,000, on top of $28,000 in loans to himself. Scott York raised quadruple that amount even as a very late entrant to the campaign. In fact, nine of the district supervisor candidates raised more money than King. The message of King’s campaign in the final week is that he is the “Republican” candidate. 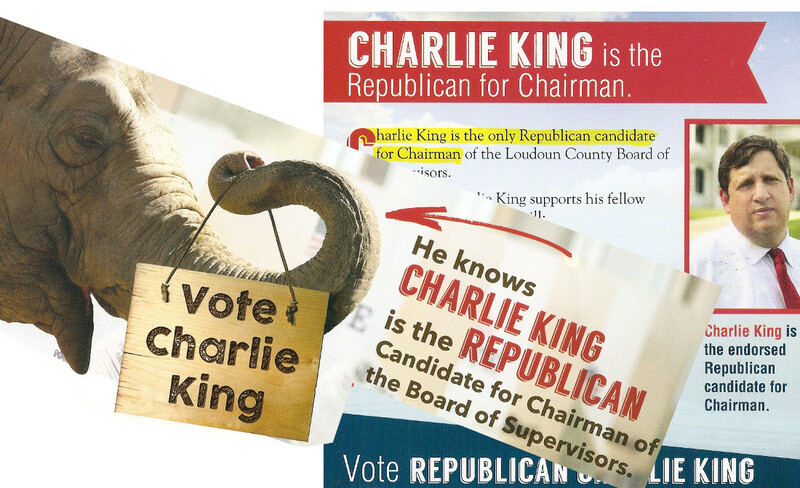 Second, King’s promotional campaign, which seems to have begun last week (at least at this Sterling household), appears to acknowledge that he’s Republican-challenged. The message of his mail pieces is that Charlie King is THE Republican in the race, in case you didn’t know. A robo-call from Ken Cuccinelli this morning had the same message, and “Republican Charlie King” seems, along the lines of “Pistol Pete Maravich” or “Broadway Danny Rose,” like the drumbeat phrase we are supposed to internalize in the final week of the campaign. Which is all fine and good, and probably necessary, especially when one of the King campaign’s most resonant public statements of the past two months was for a position opposed by our Republican sheriff, and supported by the Independent and Democratic candidates for sheriff. In a year when voters seem more than willing to thumb their noses at the party anyway, King has to hope he is the one to inspire loyalty among Loudoun County Republicans. 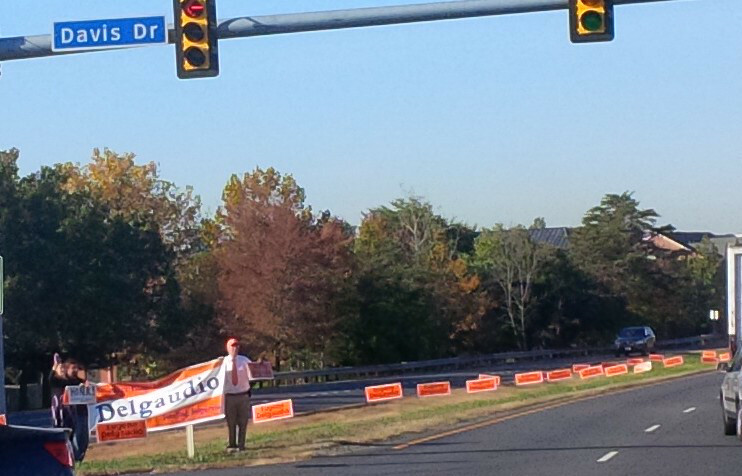 Eugene Delgaudio’s campaign won the Sterling “sign wars” and may be about to win an historic fifth term in office. Every four years, Loudoun County Democrats try to defeat Sterling District Supervisor Eugene Delgaudio, a Republican, and every four years for the last sixteen they’ve managed to fail despite massive pre-election bluster and fulminations. This year, a rumor has been circulating in Sterling that the Democrats are not entirely united behind Delgaudio’s opponent, Koran Saines – which raises the question, yet again: Are the Democrats really intent on removing Delgaudio? 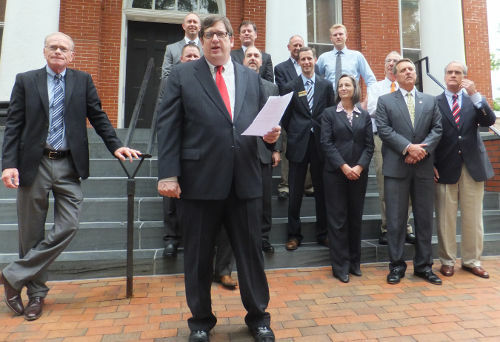 The endorsements included many local Democrat office seekers – Randall, Umstattd, Ohneiser, Boysko, Liz Miller, Bell, Murphy, Wexton, Favola – and two running for the non-political offices, Flannery and Sheridan. Missing was any endorsement in the Sterling District, certainly a significant omission on this person’s list, in the same sense that a missing roof would be a significant omission on a new home. The loyal Democrat felt compelled to state opposition to Delgaudio, without quite being able to identify Delgaudio’s opponent by name. 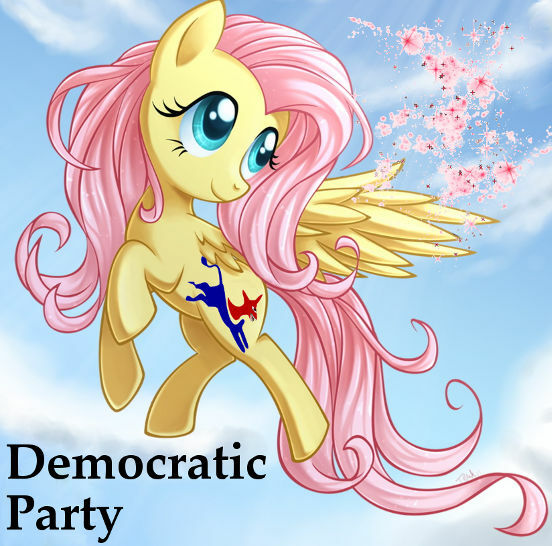 (Which would leave open the option of Sterling Democrats casting a write-in vote). I don’t know what the problem is with Koran Saines: Having met him, I find him to be an intelligent fellow, not as ideological as you’d expect from a Democrat, and running a decent, albeit quiet, campaign. There has been the traditional dust-up between campaigns over “sign wars,” with Delgaudio claiming on social media that Saines’ campaign is stealing Delgaudio’s campaign signs – although riding around Sterling, one gets the impression Delgaudio has won the sign wars once again. But whatever is going on on the Democrat side, if there are hard feelings – if Koran Saines or his campaign have appeared untrustworthy or lacking in “ethics, accountability, community loyalty, and leadership qualities” – the Democrats are going to have a tough time defeating a savvy and tireless campaigner like Delgaudio. The Republican seems to thrive on retail politics and will have made an extraordinary amount of personal, direct contact with voters by the time the polls open on Tuesday. I speculated years ago that if Loudoun County Democrats did not have Eugene Delgaudio, they would have to invent him, because they get so much traction from his statements …. his statements outside the boardroom, that is. His day job as a nationally-known conservative activist is what gets all the attention from his partisan opponents. That Delgaudio makes great fodder for media grandstanding and fundraising letters. His voting record, however, is what you would expect from a Republican: not particularly radical, nor surprising. As an office holder, Delgaudio is a known quantity who everyone admits does care about Sterling and works hard for the district. And maybe some Democrats are deciding, as many Sterling voters have done for 16 years, that the Delgaudio they know is preferable to a candidate they are not sure about. “NO” TO MIXED-USE IN STERLING: Eugene Delgaudio (L) and Scott York say Phyllis Randall’s redevelopment concept is wrong for the community. The two Loudoun County supervisors who live in Sterling don’t always agree, but they are on the same page in rejecting a supervisor candidate’s call for new residential development in the district. Longtime residents Eugene Delgaudio (R-Sterling) and Scott York (I-At Large) say the Sterling community does not need the type of redevelopment sought by Phyllis Randall, a Democratic Party nominee who lives in Lansdowne and is running for York’s position as Board chair in the November elections. In a newsletter earlier this week, Delgaudio said “‘redevelopment’ is the wrong word to use in Sterling.” He warned that Randall’s plan would mean density-packing of new residences, and a corresponding negative impact on schools, traffic and emergency services. No, really. It is. Read about it here. Republican members of the Loudoun County Board of Supervisors are all supporting Republican candidates in the November elections, which means none of them are supporting the Independent candidate for chair, the Loudoun Times-Mirror has revealed. The only Board member who is not supporting the Republican candidate for chair is Shawn Williams, who left the GOP last month when making plans to run as an Independent and is supporting Scott York, also an Indepedent, for chair. Since the local press, god bless’em, provide fuller coverage of retail openings and closings than of local politics, far be it from us to dampen their enthusiasm when they do venture down this weird, perplexing road. We should, however, be willing to help smooth the path when possible. These political parties are, in some respects, mysteries wrapped in enigmas wrapped in press releases, and thus inscrutable. In other ways, however, they are simple. Let us attempt to untangle the Case of the Curious Dynamic. The roiling controversy did not spring up ex nihilo this week, mind you. It was actually born long ago, in the faint, hazy past of earlier this month. HELP ME OUT HERE: Loudoun Times-Mirror reporter (right) attempts to get a handle on how Republicans could be supporting the Republican candidate for Board chair. At the Republican “unity” event in Leesburg on June 5, during the interview portion, the Loudoun Times-Mirror reporter noted the Republican supervisors were standing in support of Republican nominee for chair, Charlie King, instead of current chair, Scott York, the Independent. The reporter asked why they have “switched gears” to support King, when in the past they have praised York’s work on the Board. After a pause of two seconds that felt like 20, Supervisor Janet Clarke (R-Blue Ridge) mercifully chimed in with a critique of York that went a bit beyond what Charlie King had covered in-depth ten minutes earlier, getting time moving again and the reporter off the hook. Since that lesson apparently did not sink in, we shall review the main requirement of campaigning under the Republican label. Despite what we have already established about the overall bogosity of the LCRC pledge, one part is less bogus than the others, and that is where if you are a Republican candidate for office, you don’t publicly support non-Republicans running against Republicans. Nobody would likely go through the trouble of getting the GOP nomination if not prepared to jump through that particular hoop. Republicans are going to support Republicans publicly, almost every time. That is not a piece of shocking news. Any Republican candidate doing otherwise would be shocking, not to mention enormously inconvenient for the candidate. That’s what would constitute a news flash. To be sure, there are curious aspects to the 2015 campaign for Board of Supervisors, in that the local Republican Party was split over the sheriff primary contest last month, and one faction in that battle is tied closely to the campaign of Charlie King. Oaths were uttered, suspicions raised, charges of treason tossed around, and some say bridges might have been burned. But that is inside-inside baseball. Even in that cloudy picture, most of the GOP will be pro-GOP for public attribution. If you want to report that story, you will have to dig deep into a thicket of anonymous sources. But the question of whether any Loudoun Republican nominee, anywhere, is going to publicly support Scott York, is about as newsworthy as mosquitoes biting in summer. 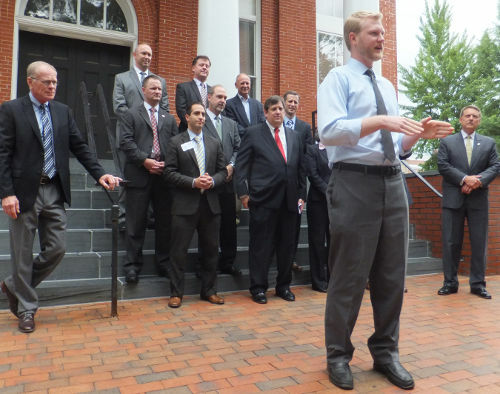 Yes, we reported last week that York is supporting several Republicans this year. But he – above all people – likely knows it would be a man-bites-dog story if any were reciprocated. When it comes to public endorsements, the “I” also stands for “Island,” which is what Scott York is on. 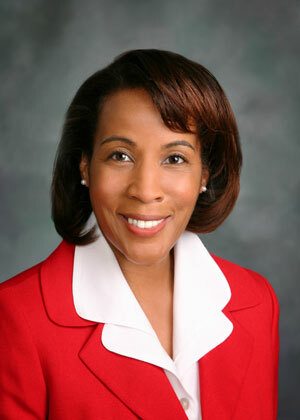 Phyllis Randall: Clear policy ideas and a commitment to “facilitate consensus” on the Loudoun Board. After a decade of unprecedented growth, Loudoun County faces a new phase of changes and opportunities. Phyllis Randall believes it’s time for fresh leadership, and a new tone of openness and ethics in county government. The Democratic Party nominee for chair of the Loudoun County Board of Supervisors (BOS), Randall has a twenty-year history of volunteer service in roles of increasing responsibility, including her current position as vice chair of the Virginia Board of Corrections. Throughout her time in public service, Randall has also maintained a career in the mental health field, which she intends to put on hold if elected to the Loudoun BOS. In a recent interview with FirewallNOVA, Randall set forth a clear policy agenda regarding education, development, attracting businesses, and the need to revisit the county’s Comprehensive Plan. On education, for instance, she’s committed to increasing science/math/technology and vocational instruction, and establishing a more cooperative relationship between the BOS and the School Board. She has specific ideas about the Loudoun Gateway and Ashurn Station Metro developments. She wants to improve the transportation grid to make the county more business-friendly (a proposal echoed the other day in Reston with regard to the Silver Line). In the area of politics, Randall takes exception to the idea that Sterling’s Eugene Delgaudio is attracting Democrats to vote for him. FWN: For Loudoun residents who don’t know about you: I think of you as a “moderate” Democrat. Is that true, and what does it mean? Candidates for chair of the Loudoun County Board of Supervisors. Barring any disqualifications, the candidates who will be listed on Loudoun County voters’ ballots on the November 3, 2015 elections have been set. Despite rumors to the contrary, no new candidates for sheriff filed to run. And Shawn Williams did NOT throw his hat into the ring to revive his previously announced run for chair of the Board of Supervisors. (The day after Williams was reported to be making calls to build a campaign team, this happened.) The Democratic candidate for chair, Phyllis Randall, states that she shares Scott York’s wish to revisit the county’s Comprehensive Plan. Read the full story at Leesburg Today. 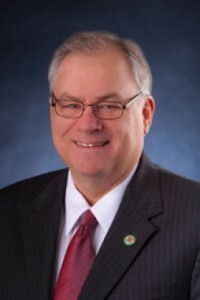 Chairman Scott York thinks the decisions facing the Loudoun County Board of Supervisors over the next four years are too important to be used as on-the-job training. Having served as Board chair since 2001, York was planning to leave public office when the current term concludes at the end of the year. But after being on the receiving end of an “outpouring of concern for the quality of leadership” from constituents, he reconsidered, and is running for a fifth term. 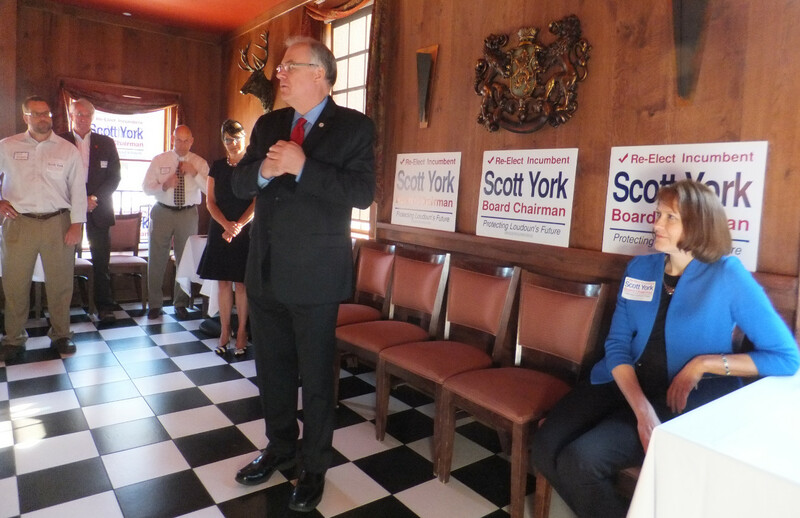 York is running for the office once again as an Independent, as he did prior to the current term, and will face declared challengers Charlie King (Republican), Phyllis Randall (Democrat), and Tom Bellanca (Independent). 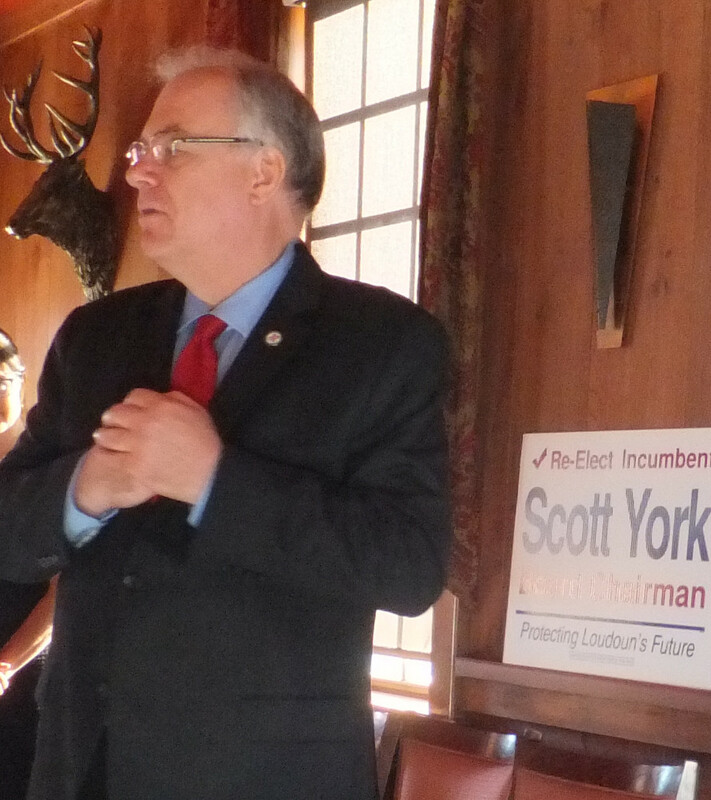 York believes any voters who “do their homework” or talk to the other candidates will come to the same conclusion. In the coming years, that leadership will be just as crucial, according to York. The next Board will need to handle numerous important policy issues, including: oversight of critical transportation improvements; a long-overdue review of the county’s Comprehensive Plan; Silver Line Comprehensive Plan Amendments, initiated by the current Board to study land uses surrounding the new stations; as well as address school budget funding, new school construction, and requests for all-day kindergarten. Having previously endorsed Sheriff Mike Chapman for re-election, York is also announcing support for several other candidates in the upcoming elections. FWN: What are the top issues that will face the Loudoun County Board of Supervisors over the next four years? Michael Haynes, chairman of the Loudoun County Republican Committee (LCRC), observed that “after days of rain and gloomy weather, the sun came out to welcome our candidates,” an appropriate backdrop for Friday’s GOP “Unity” event in Leesburg. Joined by Republican Party of Virginia Chairman John Whitbeck, it served as an unofficial kickoff for the 2015 campaign, a chance to clarify positions on Independent candidates, and an opportunity to smooth over differences from the recent LCRC convention. This is the second half of our coverage of Friday’s event. As noted in yesterday’s post, Sheriff Mike Chapman carried the GOP’s main message of unity (contrasting with the chaos on the Loudoun Democrats’ ticket). King took two Independent candidates to task: Scott York (Board chair), who left the Republican Party, and Steve Simpson (sheriff candidate), who pledged to support the 2015 ticket, and then broke the pledge for a second time since 2007. Based on an officer’s word, people will be convicted of crimes and sent to jail. How can Steve Simpson possibly lead the Loudoun County Sheriff’s Office when he cannot honor simple promises to play by the rules? Loudoun County needs a decisive leader. If Mr. York takes months to make a decision while reversing himself over and over, how can the voters believe he is capable of making the many tough calls the next Board will have to make? 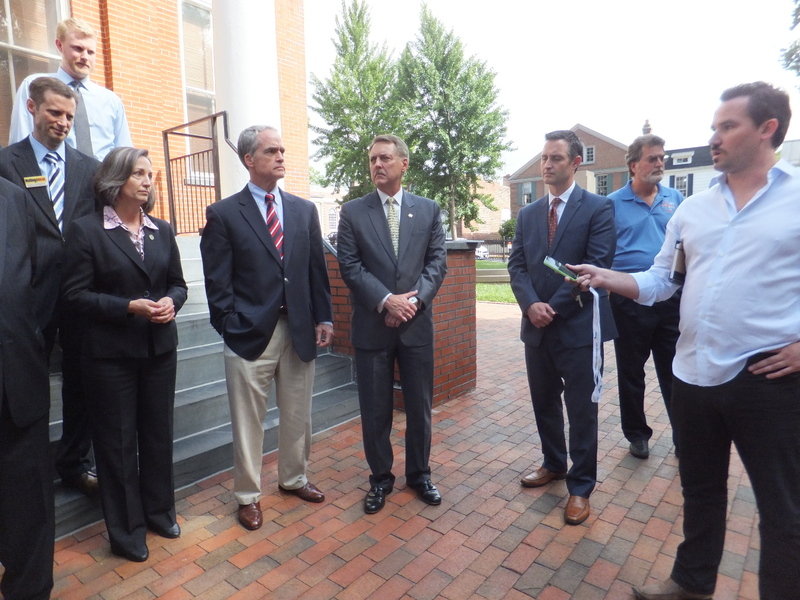 The GOP nominee for Broad Run supervisor, Ron Meyer, highlighted nuts-and-bolts issues showing the Republican ticket unified on “conservative values to make people’s lives better …. Better commute, better schools, better cost of living, a better place to be.” Meyer noted the economic potential of Metro locations coming to Loudoun, and said commercial development will allow the county to continue increasing school funding and road improvements. 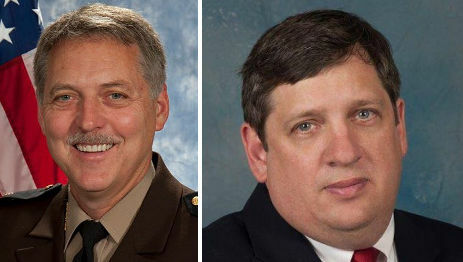 LCRC leadership needed to wait two full weeks to defend Sheriff Mike Chapman (L), and presumably will now wait until June 8 to defend Charlie King. The political business of the day in Loudoun County is called moral equivalence. And business is good. The local Republican leadership waited a full two weeks to defend Sheriff Mike Chapman against a rebellion contravening party rules, presumably out of prudence and a need to gather all the facts. It is safe to assume, then, that those same leaders will wait another two weeks – until, say, June 8 – to defend Charlie King. Let’s not do anything rash, please. Loudoun County Republican Committee (LCRC) Chair Mike Haynes just issued a stern press release which is reprinted below the fold. In it, Haynes calls on former sheriff, former Republican, former Independent, newly-Republican and once again threatening-to-go Independent Steve Simpson, to please stick to the GOP “pledge” that Simpson just signed in order to vote at the LCRC Convention earlier this month. To recap: Soon after the LCRC Convention results quashed the attempt of a GOP faction to take down Republican Sheriff Mike Chapman, Steve Simpson announced he was considering a run for sheriff as an Independent, despite having just rejoined the LCRC and supported Chapman’s challenger. It became evident, and not very secret, that some in the anti-Chapman contingent of Republicans might be quietly celebrating Simpson’s entry. Voters need to have a choice, don’t ya know. Response from the LCRC leadership about this open threat to reneg on the “pledge”? Not a peep. Presumably Chapman was on his own. Then yesterday, when Shawn Williams made noises about going back on HIS pledge, and joining the race for chairman, and dealing a very real threat to the head of the Republican ticket, Charlie King…. apparently alarms went off. As they say in the vernacular: S–t just got real. And the wink-wink at Steve Simpson became a little too hypocritical for comfort, apparently. So before Haynes could fire off a press release chastising Shawn Williams – a press release that would pass the laugh test – someone must have whispered in his ear that he’d better, first, address that Steve Simpson fellow who was doing THE EXACT SAME THING two weeks ago. Unfortunately you cannot back date a press release, but better late than never. Mike Chapman finally got his party leadership’s support, and in a couple of weeks Haynes can issue a new press release, condemning Shawn Williams, that will not be met with a chorus of guffaws. Here is the text of today’s LCRC press release.